Leaders from around the world gathered in Caracas on yesterday evening for Venezuelan President Hugo Chávez's funeral today. More than 30 heads of state and various other diplomats from Latin America and all over the world were present for the event, which began this morning and was televised live around the country. Meanwhile, multitudes of supporters surrounded the Military Academy, still waiting for their chance to pay respects to their beloved president. Vice President Nicolas Maduro, who is currently being sworn in as the interim president, lead the ceremony, giving an emotive speech on Chávez's legacy. "He made us rediscover the history of our homeland, he raised the flag of Simon Bolivar and embodied it," said Maduro. "His soul and spirit are so strong that his body could not handle it, and now his soul and spirit roam the universe, spreading and filling us with blessing and love," he said. Maduro explained that Chávez had asked them to help him write some final words in case he died, a sort of final message, but that his ministers simply could not do it. "We couldn't do it, it was impossible. But he had already written his will. His whole life had been his will, his actions, his work, his people, and all the humble ones in this world," he said. Maduro outlined several major tasks that Chávez left for the Venezuelan people to continue, including a continuation of what Chávez called 21st Century Socialism. "He left us the task of continuing to build this democratic socialist model that he began. He left everything arranged for us. Now it is on us if we do it or not. We call on the people to do it," he said. The world leaders present were called in groups to stand and flank the president's casket and observe a moment of silence as honor guards. 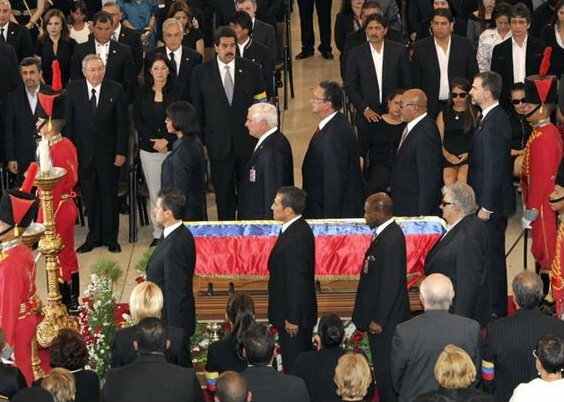 Many key figures of Venezuelan public life who emerged on the scene thanks to support from the Chávez government such as Olympic medalist Ruben Limardo and world-famous Venezuelan conductor Gustavo Dudamel, were also called on to stand with the casket for a moment of silence. There were several musical performances of famous Venezuelan songs by various Venezuelan artists, while Maduro placed on Chávez's casket a replica of Simon Bolivar's sword, a gift that Chávez often offered to foreign dignitaries. Hollywood actor and personal friend of Chávez, Sean Penn, was also present, as was the Rev. Jesse Jackson, who offered a prayer. "Hugo fed the hungry. He lifted the poor. He raised their hopes. He helped them realize their dreams," he said. Masses of people still waited outside the building for their turn to view Chávez, and it became clear that there was no way that everyone would be able to have a chance to pay their respects before the funeral service. This lead Maduro to announce yesterday that Chávez will be preserved and put on permanent display in a military museum so that all Venezuelans would have a chance to visit him. "Yesterday there were millions in the streets and we know there will be millions more," said Maduro. "The body of our commander-in-chief will be embalmed and placed in the Museum of the Revolution in a special way: in a glass case so that the people can have him there forever." "We want everyone who wants to see him to be able to, with love and respect," he said. Maduro explained that his body would remain in its current location for at least 7 more days for those who wish to view him. President of the National Assembly Diosdado Cabello also announced today that Vice President Nicolas Maduro will be sworn in before the National Assembly as interim president in a formal ceremony this evening. Opposition legislators have announced that they will not attend the ceremony.